Two exhibits for the price of one! 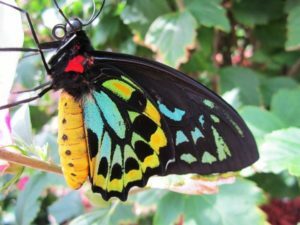 Your admission lets you in to see our magnificent 1800 square foot Butterfly Garden with live butterflies from all over the world and our FREE Butterfly Chart (Butterfly I.D. Chart is a good educational challenge for kids and adults to find and identify the different butterflies flying freely in the garden). Be amazed as 800 of the most colorful and unusual live butterflies fly all around you, sometimes landing on you. This is a perfect photo op! Our one-of-a-kind Insect World is a combination of fascinating, GIANT insects, both on display and live. And don’t miss the turtle pond, where you can ‘search’ for Houdini. Come and get a picture taken with our Bearded Dragon, ‘Falcore’ ! Kids will also enjoy the interactive musical butterfly wall – a learning a fun experience! While on the Island, your ticket purchase will get you unlimited visits. Great way to keep the kids entertained in between the other fun adventures you will be seeking! **** Children 11 and under must be accompanied by a responsible adult. The Corbetts- “Awesome again! We’ve been here before since you opened…we will be back!